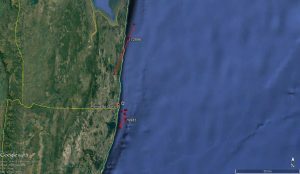 Tiger sharks – tagging update! The satellite transmitters are attached to the fins of the sharks (see BLOG https://biopixelresearch.org/guide-tracking-tagging-part-3-3/). 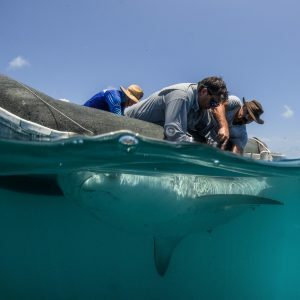 To hear from our tagged sharks they need to break the surface of the water long enough to send signals that can be used to locate the sharks (see BLOG https://biopixelresearch.org/guide-tracking-tagging-part-3-3/). 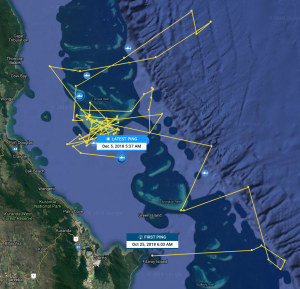 Our two tagged sharks on the GBR have displayed different behaviours. Zuza spends a lot of time on the surface, and therefore regularly sends messages of her location. Whereas Siegi is only surfacing every so often, and some of her surfacings have been too fast to get the locations locked down. 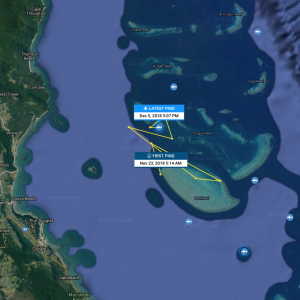 However, based on the detections so far both sharks are remaining close to the Batt Reef area for now. As the water temperature increases over summer it will be interesting to see if these sharks leave the shallow area of Batt Reef. 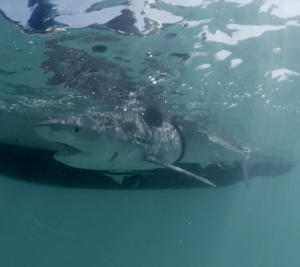 The Mozambique sharks are also showing variation in surface behaviour. Sereia tagged on 19th November has only been detected a couple of times. Whereas Sophie Grace tagged on the 23rd Nov has been sending messages more regularly. 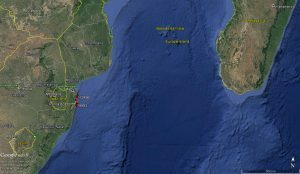 One of the sharks has headed north and the other south from the tagging location in southern Mozambique, close to the South African border. In the first days of tagging, both recently tagged sharks have remained coastal, as has the male shark Hobbs tagged earlier in the year in Mozambique. However, Gurthrude the female shark tagged earlier this year moved across to the east coast of Madagascar – see OCEARCH for their latest movements. To follow our local tagged sharks on the shark-tracking OCEARCH map. Cairns-based tagging was conducted by the team from Biopixel Oceans Foundation, Dr Adam Barnett and Richard Fitzpatrick along with Dr Nicolas Payne from Trinity College, Dublin and with the support of liveaboard charter boat, Argo Expeditions. We will be tagging more sharks over the next few months – check our Facebook for all the latest news.